I often describe Space2Create as a benign dictatorship. If that were true it would not be a healthy way to run an organisation but sometimes it feels like that. At the end of the day one person has to take the lead and make the final decision. Even if the decision is empowering somebody else to make the decision. In that sense S2C is very top down. But actually it’s not, it is also bottom up. Ideas and suggestions feed upwards from service users and what we do generally comes from the whole organisation putting itself behind somebodies ideas. It also runs itself on a very lean volunteer force. Being an organisation that aims to empower it’s Service Users and enable them to rebuild and regain esteem and confidence a lot of the running and organising is done by its Service Users. Sometimes, however I feel the need for more support, volunteers with particular skills to share the load and help the organisation run better. It’s not always the exciting stuff though, admin, web site, fundraising, project management, one to one support, promotion, networking, managing volunteers, supporting service users, running creative sessions, organising exhibitions, hanging and framing exhibitions…….and more! We need people who can givc a bit of time and help us achieve our aims. Doing the dull bits doesn’t mean you can’t join in the fun stuff too! I have been thinking about how we organise and how it can be made more efficient and give a better service. The recent threat of closure to Kentmere Ward has also made me think how Space2Create involves itself in the more campaigning role, raising awareness and challenging stigma. Every now and then in the coming weeks I will be asking questions to everyone about how we can solve some of these challenges and make S2C even better. No one person can do it. It takes a real team effort and the whole of an organisation to get behind change, one of the biggest hurdles is to admit the need for change and we need to change so we can do better for those who need us. 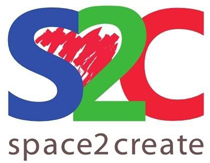 If you think you might be able to help or give us some of your time to help vulnerable people in our community then get in touch: info@space2create.co.uk also keep an eye on our website where we will be making changes and letting people know just what help we need in the near future. Today we were looking at Yayoi Kusama, a Japanese artist. Her work involves creating bold, bright and intricate patterns within simple shapes such as butterflies, peppers and flowers. Using her ideas we created our own pictures, based on the theme of water. Others continued with or completed their own personal projects. We took a range of record covers into the ward, and a variety of different media in which to try and recreate those of classic rock bands such as Pink Floyd, Zeppelin, The Beatles and David Bowie. Rather than simply copying the covers, we tried to create interpretations of the designs, using collage, pens, sharpies and pencils. We also took tracing paper, which one of our artists used to create versions of some personal photographs. We continued to work towards the Creative Challenge set by the Blooming With Dementia project, by making as many more recycled ‘flowers’ as we could for the display at the Unit. Others also continued with their individual projects. Don’t forget that the ‘Blooming With Dementia’ Open Day and Workshop take place between 10am and 4pm at Unit 31 tomorrow (Sat. 28th May – see previous S2C post for details)! We need current services maintaining not cutting, but we deserve better! I am, of course, talking of Kentmere Ward. Our local Mental Health Ward that supports people with serious mental health issues who may be in danger of causing themselves harm or need round the clock monitoring as they have medication assessed among many other reason patients with a mental health issue require 24 hour care. The team at the ward work hard to create a safe environment and meet the needs of their patients. Where patients have need for regular care they become familiar with their needs and how they are supported. Building a relationship between a patient recovering from a mental health issue and their carers is a vital part of recovery. All this could be lost. With the decision to close the ward many of us in Kendal fear the implications for those who need that care. Taking the lead role in a local community based Charity dealing with many people with Mental Health issues and suffering Mental Health issues myself, I fully appreciate the impact this will have on the community. For many of our Service Users the loss of that security in their care and the prospect of being sent regularly to distant facilities is truly terrifying. For those of you reading this who are fortunate enough to have never needed such care you still need to fight for our local Mental Health services. With one in far of the population likely to face a mental illness to some degree it is in all our interests we maintain them. And why should we put up with just holding on to them. Reasons for closure highlight problems identified in a Care Quality Commission report. We know the problems at Kentmere but rather than just sweep it all under the carpet there is an opportunity to provide first class facilities that deliver the promises of the Government about Mental Health being a priority and also give South Lakeland the provision it desperately requires. Below is a summary of last weeks happenings at S2C. Don’t forget the wonderful exhibition “Blooming With Dementia” is on at Space2Create in the gallery by the In The Moment Group. You can come along Saturday 28th May and for a donation make flowers to decorate the unit and add to the exhibition. Also our exhibition on the theme of water is open to any one to put in work of any kind. Painted to knitted to photos to 3D to written. Anything! Closing date is 30th June for submissions. A busy session. We used ripped up pieces of thick absorbent paper and a few different techniques involving Brusho ink. Used sprinkled as powder and having water dropped on, made up and painted, making the paper wet and letting colour bleed into it. We also applied it with pipettes, blew it with straws, brushed it and used spoons to spread it! The usual mixed session. A few were making more houses for Yarn in the yards bunting. Alongside this some drawing, knitting and biscuit decoration. All were busy and enjoying being creative. The group were making felted flowers to add to the “Blooming With Dementia” exhibition today. One person had also made some butterfly’s to add to the display. A quiet but good session this morning as the group used myth and legend to inspire their writing. After a warm up the group was rewriting well known fairy tales or myths which was good fun. Few different things going on! The main was creating catd sculptures. Firstly by decorating both sides of a piece of A4 card by any media. Collage, zentangle, ink….then cutting it up with one continuous cut so it stays whole. Finally sculpting it into shape by twisting and weaving the parts. Joints are made by cutting g to slots and sliding them together. Others drew and sketched. This week has reminded how diverse Space2Create is. No, more than that….diverse, accepting, tolerant and understanding. There are many more words I could use. Everyone is welcome. No matter their trouble, their past, their issues or illness. We are there as a supportive and safe place to be creative. Over a week we have groups, some run by us some using our space, aimed at adults with learning difficulties, the Deaf community, mental health, dementia. General groups which contain all the above and many other illnesses. It doesn’t matter why they need to come. For many having a place where that isn’t an issue is a relief. If you go to the hospital or doctors for appointments then the illness or condition is the focus. What S2C looks at is the person. Making them feel safe, feel wanted, feel supported, feel confident, feel they have worth and feel like they belong. Those are the things that many people, all for their different causes, come to be creative at S2C for. The coming week is Dementia Awareness Week. In The Moment is a Dementia Group based at Unit 31 run by Lakeland Arts that looks to use creativity to support those suffering with Dementia and their carers. They are exhibiting in the Unit during May showing the stories and work they have created this year. A very emotive and interesting collection of art they have created too. During May they are asking people to be sponsored to make flowers to add to the exhibition turning Unit 31 into a garden of flowers made from recycled materials. You can join the group each Friday in May between 1 and 4pm to make flowers. On Saturday 28th May 10-4 there is an open day making flowers and a chance to see the exhibition. The exhibition can also be viewed 9-12 each morning Tuesday to Friday. The group were creating very stylised and colourful landscapes. We looked at work by artists such as Darren Mundy online and experimented with blending to produce surreal views. Some very interesting and bright work resulted. Another really good writing session with Maggie How. After our usual warm ups we then put together writing from lists. Creating lists of words to inspire various pieces. After a break we then tried writing a piece without using adjectives using simile and metaphor instead. We finished off with a quick exercise on a place we had scary or poor memories about. Here is on resulting piece on the theme of caravans! A dark dense damp fusty musty smell. Caravaning in Llandudno. The families 70’s idea of a cheap holiday involving the borrowing of a friends mobile home, permanently nailed to a pebbled concrete slab on the stormy North Wales coastline.Laying in a bed that was three foot too short. Unable to sleep as every nut, bolt, nail, screw, bit of plastic, wood and metal performed a wind assisted symphony of impending demise. It was so dark. Darkness that seeped into your soul perforated already by the cacophony of inferior craftsmanship. It was so cold. The dampness sucked all heat from the body. Dreams were of fiery rolling caravans plunging endlessly off embittered Welsh cliffs. A week. The senses reeled and stretched the week into a painful eternity that still lurks deep within my bruised psyche such that to even pass a caravan now is to relive the sights, smells and sounds, perpetuating the misery well into adulthood desire for en suite accommodation. The session carried on, adapting a deck of playing cards. \we used sharpie pens to add detail to the cards, giving them new arrangements and designs, we also used an A4 folding template to provide pockets to hold the cards in, we used cartridge paper and tracing paper to make them more interesting. The group continued with making for various projects. There was some clever recasting of a Banksy, house bunting for Yarn In The Yards, felt flowers for Blooming With Dementia and a rather intriguing Venezuelan Moth making attempt! Another day….. The group were producing bright and colourful landscape scenes. A fun session led by Anne-Marie from Lakeland Arts making felt flowers. This was done by layering brightly coloured wool, using hot soapy water and rolling it in mats to create the flat flower outlines. Then we shaped the flowers, gave them another role before adding stamen and holding together with wire. These will go to the new exhibition at S2C by the On The Moment dementia group. Called coming With Dementia it shows the groups creative journey with Dementia and intends to fill the unit full of flowers made from recycled materials. I always find it amusing how sometimes things just sound better in a different language. The language you use has to be researched. It is worth heading onto Google Translate and experimenting till you find one that sounds right for the statement. Recently I finished a painting. In my head it was “Two bronze Rabbits”. Not the most evocative or inspirational but it did state what it was. A play around and I found the French translation gave it much more. “Deux Lapins Laiton”. Collaboration is becoming a requirement for small charities. A necessity. To share resources, experience, skills and money in a political climate that is reducing provision for state funded care and looking ever more to the Third Sector to take up the burden. The resources need to come from somewhere and just as Government Departments slash their budgets through efficiency savings, Charities must do the same in order to achieve their goals. I had the pleasure of reinvigorating a long standing relationship with a fantastic charity this week. Pioneer Projects has been an organisation that has inspired and influenced the development of Space2Create. Like all such Charities, the times are causing a rethink of direction. It was lovely to meet their new director Paul and chat. It is clear that we see very much eye to eye on what is needed and so I look forward to working with him as we both seek to see our organisations become stronger and the service we give our service users better. A good session led by Maggie with our usual warm up of free writing. We had a good long chat about the group and possible plans too. We then did a number of creative writing pieces from starters that Maggie gave us in different forms from prose to poems and sometimes a bit surreal (nothing wrong with that). I approach the inner sanctum. Awakening her from divine slumbers. As I prepare the act of worship. To recieve the blessed boiling water upon my coffee. On the ward we made little plasticine models, and then glued them onto pre-prepared small picture frames. This was a very tactile, accessible and enjoyably relaxing activity, which resulted in some wonderfully engaging work. The group today were doing lovely little works of art on postcards. Some as pen sketches and some zentangled. Lots going on. Houses for Yarn In The Yards, twiddlemuff knitting, fabric collage, small pictures, insect art, apron making! A very creative group all with their own ideas. Anne-Marie from Lakeland Arts took the session. She had the group making flowers from recycled materials. This included melting, painting with nail varnish, cutting, bending, warping and glueing. Really fun session. The flowers will go towards the upcoming exhibition by the In The Moment Dementia Group at our Unit. Wellbeing is an important concept for those of us fighting to recover or cope with long term illness. Our wellbeing wont cure or resolve those problems but it will make recovery easier or prevention of low mood possible. People become ill for many different reasons and in many different ways but for all illness and life changing events there is a tendency towards isolation and depression. Fear, pushing people away, losing contact, lack of mobility restricting opportunity, feeling too unwell to go out and many more. The sort of things many will recognise who have illness or are facing massive upheaval. At S2C we use the “Five Ways To Wellbeing” as a guide. Connect, Give, Be Active, Keep Learning, Take Notice. This is a useful toolkit for everyone in their lives to help maintain wellbeing and protect yourself from mental health issues such as mild depression, loneliness and isolation. By coming to sessions at S2C you are being active, you are out of the house and made the effort to get to the session and in the session you are active, doing something. You connect, with S2C as an organisation but also with the other people there who are or have been in exactly the same position. You give as you put a donation in the tin or you give your time to help somebody, make a drink for someone or even just by chatting to somebody giving them chance to connect with you. You learn new skills, techniques, about ne media, about artists about events and about other people. You take notice of the session leader showing you what to do, of the work around you, of other peoples conversations, the art on the walls, the different types of biscuits in the biscuit box! All that engagement adds up. It helps at both ends. It helps prevent you becoming depressed, lonely and isolated. It helps you recover and pull out of depression, loneliness and isolation. Seems quite simple doesn’t it. If you feel that your wellbeing is not good or know somebody who has poor wellbeing then start looking to those five ways to improve it. Another lovely session today with Carol Gaston. We were painting the cog pictures we started last week. When dry they will be outlined in pen to finish off. This weeks session involved designing and folding different cards and papers to create paper garments. Using paint, ink and magazines for collage, we decorated the paper and folded it into garment shapes. Accessories were than added with card and paper. While the DeafArt group were mainly chatting the Thursday Group were busy. Apron making, knitting hand muffs, drawing zentangles, painting, making postcard art and textile houses for yarn in the yards. Jane led the session. The group were joining other groups from Space2Create who have been making a variety of postcards to send to Card2Kendal for the flood appeal. Some work still to do. If you want to do one why not call in to our Unit at the Factory on Saturday between 1 and 4 for loads of art materials and postcards are there for you to create a masterpiece. Some great ideas coming together.